We have assigned groups every half hour so the Blessed Sacrament will never be left alone, please see the Lenten Flier that has a complete list of all the groups and times assigned, but you can of course come at any time you wish. Maybe you have never been to adoration and you are not sure what you are supposed to do? Come, experience your own half hour with the Blessed Sacrament. 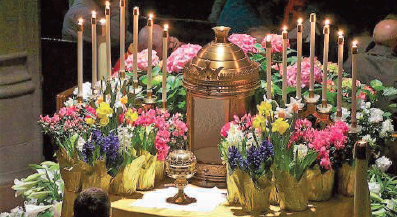 Pope Francis said, “The Eucharist is the spiritual life-blood of the Christian because in receiving it we consume the glorified Body of the Risen Lord, whose life transforms us, elevates and empowers us to become like Him.” Receiving our Lord in the Eucharist and spending time adoring him in the Blessed Sacrament enables our hearts to be molded into the person God desires us to be.